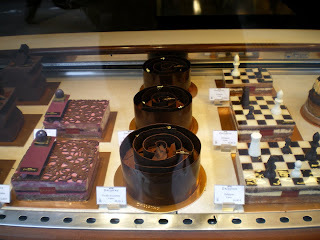 Paris -- Pastry or Art? Located at 101, rue du Faubourg Saint-Honoré, Dalloyau is not to be missed. Its pastries are as good as they look, and it is a marvelous place to go for tea. I am often complimented on my salad dressing, so I will share my method here. Generally, for an Italian style dressing, I take a little Italian red wine vinegar, whisk together with a tiny bit of tomato vinegar* and lots of finely chopped herbs, my favorites being tarragon and chives, and coarsely ground black pepper. I add a couple of inches of anchovy paste because it gives great depth to the dressing, without tasting of anchovy: this is my secret ingredient. But you can use salt. Then I whisk it all and add very good Italian extra-virgin olive oil until the texture is right. After I dress the salad, I add a sprinkling of grated fresh parmesan cheese, more black pepper, chopped scallions and bigger pieces of the herbs I used in the dressing base. An option is to cut a clove of garlic and rub the cut edge on the bowl before making the dressing. * Tomato vinegar is a great product. It really is made of tomato, not just flavored with it, and adds great depth without the sweetness of balsamic. It is inexpensive but a bit hard to find. Available at the famous Kalustyan's, 123 Lexington Avenue. If necessary, you can substitute balsamic but very judiciously, please. For French style, I use the same technique, but with French vinegar (Orléans or better still, if you can find it, Banyuls), French extra-virgin olive oil, salt instead of anchovy paste, and grated or shredded gruyère cheese at the end instead of parmesan. I often make and save some of the French version, but can turn it into Italian by adding a little tomato vinegar and/or Italian red wine vinegar and finish with parmesan cheese instead of gruyère. For a great basic vinaigrette, I use Gordon Hamersley's "Classic Bistro Vinaigrette," published in his wonderful Bistro Cooking at Home, and enhance it by using generous quantities of fresh herbs as above - generally tarragon and chives but others are fine, too. It is so simple that I hope he won't mind my publishing it here. Whisk all but the oil together, then slowly whisk in oil until an emulsion forms. I find this keeps pretty well in the fridge if you don't add the herbs until you want to use it. Until now, I have eschewed creamy dressings and sweet ones, but I hope to branch out. Our family's Thanksgiving has been my mother's holiday since 1966, and was her mother's before that. These many Thanksgivings provided many happy memories. This year, though, due to family travails, my mother relented and allowed me to host the event. Before this year, I have only made two turkeys, in Paris in 1979 and in Tokyo nearly twenty years later, in 1998. I confess I don't recall anything about the French dinde, except that it was delicious and quite different from the American bird. The Tokyo turkey was a frozen American like most people here eat, made in the most classic way, that I served at a house party for my office staff, mostly Japanese people who had never experienced a whole roasted Turkey, let alone a traditional American Thanksgiving. Anticipating that I might someday be called upon to take over the family duties, I have been assiduously saving interesting recipes for turkey, stuffing and Thanksgiving sides for years, so many that it was hard to decide which to choose. Not only are there a million different flavors, there are also a million methods. To brine or not to brine; to rub or not to rub, to slow-cook or to fast-cook, to stuff or not to stuff: these are some of the questions that a first-timer must address. My first decision was to keep it fairly traditional - no southwestern or Asian spice rub, however appealing they might sound. Second decision: not to stuff the bird, for multiple reasons (primarily, I'd rather use the juice (defatted) for gravy than to eat all the fat in the stuffing) but to make dressing separately. Third decision: not to brine; a friend who is the best cooker of birds that I know said she had tried it and found it of marginal, if any, benefit if the turkey is of good quality. Fourth decision: to use Michael Chiarello's fennel spice rub and his fast-cooking method (available through www.foodnetwork.com). So, I made his delicious rub - lots of fennel seeds, white peppercorns and coriander seeds, toasted, then ground, with salt - oiled the 15-pound turkey with olive oil on and under the skin, and put in the fridge overnight. Took it out an hour and a half before cooking at 425 degrees for just 3 hours (165 degrees in the deepest part of the thigh), left to stand for 20 minutes and voila! : a delicious turkey, with pretty moist white meat and lots of tasty, crispy skin. In case anyone cares, the side dishes were a pretty classic herb and onion stuffing made with large cubes of ciabatta bread, Mark Bittman's sweet potato gratin with hazelnuts, ginger and orange zest, green beans with Meyer lemon vinaigrette and parmesan breadcrumbs (from New York Times), a green salad with my Italian dressing (see my posting on Salad Dressing), my mother's delicious cranberry chutney, and boiled white rice (ours is the only non-Asian family that eats white rice for Thanksgiving - not my idea). The sweet potato gratin, from a recent New York Times, is a keeper; try to get it on line. I will certainly improve on the stuffing and replace the green beans with a different side next time. Of course, Thanksgiving wouldn't be Thanksgiving without hors d'oeuvres and desserts. In keeping with the holiday's traditions, my sister-in-law brought a truckload of delicious appetizers and desserts, and my mother-in-law furnished her delicious home-made cranberry and pear tortes. Needless to say, everyone was sated and happy. My strategy to prepare for next year (if the feast does not revert to Mom) is to have an experimental Thanksgiving dinner in the spring, say April, for a group of adventurous and honest friends, and to try one or more of those exotic Asian or Southwestern recipes. It'll probably be a good meal and in any event won't "count" as a real Thanksgiving; still, I hope to get some ideas that can be applied to the real thing. Please share your suggestions and experiences. A short Paris street that will be of interest to food lovers is rue Paul-Bert, in the 11th arrondissment, Metro Faidherbe-Chaligny. There are three well-known bistros, an Argentine steak restaurant and a bookstore specializing in food-related books. Le Bistrot Paul-Bert, at Number 18, is a well-known, very traditional Paris bistro with high-quality products, well prepared. Le Temps au Temps, at Number 13. The night we ate at Le Bistrot Paul-Bert, one of our friends literally pulled me across the street to this bistro. I recently visited it, and was lucky to get a seat at the tiny bar, since the tiny place books weeks in advance. I had a nice meal, especially the Lyonnais sausage starter. The place had recently changed ownership, but I found it very good and inviting; stay tuned. L'Ecaillier du Bistrot, at Number 22, is a bistro attached to a poissonerie. I have not been there but it is highly regarded. Walking by it recently on my way to Le Temps au Temps, I resolved to go there next time I am in Paris. L'Unico, at Number 15, is a Argentine, primarily steak, restaurant set in an old butcher shop with modern furnishings. It looked pretty unattractive when I walked by it, but it was full and subsequent research indicates that it is well-respected and definitely chic. Your move. La Cocotte, Librairie de Gout, at Number 5 , is a gastronomic bookshop. When I told a friend how much seemed to be happening on this small street (see above), she said her friend has an interesting bookshop oriented to food on the same street. I couldn't get to it since it is closed Mondays and I was leaving Tuesday, but it's definitely on my list of places to check out. They sell small food items and also have cooking lessons. For more information, go to http://www.lacocotte.net. A lot of gastronomy for a little street. I just finished reading Michael Pollan's The Omnivore's Dilemma. This is a really insightful book about where our food comes from, and I recommend it highly to anyone interested in food. The first part of the book explains that if we are what we eat, we consist mostly of corn, with a fair amount of petroleum thrown in. Pollan explains in a lucid, readable way how corn became has become the dominant crop in the US and, indeed, the world, since World War II, and the implications of this on our diets, health and world economy: the dominance of industrial agriculture, less healthful food (high levels of antibiotics required due to the lack of natural antibodies in monocultural corn diet and the lack of biological richness in chemical fertilizers), inhumane treatment of animals, etc. Pretty scary stuff, but not hysterically presented. The second part of the book is about alternatives, organic farming and smaller sustainable farming. Pollan makes the case that organic has become closer to industrial than "real" farming but concludes that it is better, due to the absence of antibiotics, than conventional. The meat of the book (no pun intended) is the lengthy discussion of "grass farming," meaning sustainable, local farming based on intense management of the soil by careful grazing, involving chickens, pigs and beef in a virtuous cycle of soil nourishment and producing meats that taste like the real thing. I found this part of the book to be extremely moving, and came to be convinced that such agriculture could be commercially viable if we were able to agree as a society to factor in the total cost associated with apparently cheap food, i.e., health issues, environmental issues and, not as intuitively, energy consumption. If only . . . . In the meantime, there is something we can do, namely encouraging the burgeoning community supported agriculture movement, shopping at farmers' markets and paying the extra price for meats and vegetables that are designed (through milennia of evolution, not the laboratory) to meet the nutritional needs of our species (and which, not coincidentally, taste much better). I was already doing this for more simplistic reasons (see my post "Community Supported Agriculture"), but plan to redouble my efforts. The final section describes Pollan's foray into the worlds of hunting and gathering, in order to get closer to the food and, "take responsibility" for killing animals for food. I found it pretty entertaining, but without practical application; even Pollan admits that we are not ever going back to that way of life. The cool weather brings a lot of good things, and one of the best of these is the arrival of the vacherin du Mont d'Or in the fromageries of Paris. A raw cow's milk cheese that is wrapped in a band of spruce in Franche-Comté, just on the border of Switzerland. The texture is fantastic and the spruce imparts a woody taste and smell that must be experienced. Unfortunately, the vacherin that gets to the US is, in my experience, very expensive and not even close to what you get in France. 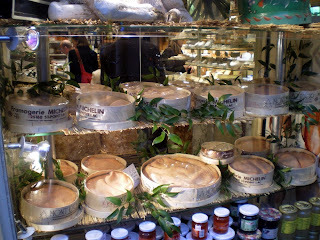 Pictured above is a window full of vacherin at Barthélemy, one of the best fromageries in Paris, 51, rue de Grenelle (7ème). Americans in Paris (myself included) seem to always be on the hunt for great bistros, featuring honest (often traditional) food at modest prices served in unpretentious surroundings. A friend introduced me to Le Petit Lebey des Bistrots Parisiens, which describes and rates hundreds of Paris bistros. Instead of stars, Lebey awards cocottes (casseroles): one for "good bistro cuisine," two for "very good bistro cuisine" and three for "one of the best bistros in Paris." Lebey's descriptions are extremely useful; they actually specify what the meal rated consisted of (including wine), the date and the exact price paid. I find the ratings to be quite reliable, and a 3-cocotte bistrot is almost always worth going to. The guide includes "modern" bistros as well as "traditional" ones. Despite the reliability of le Petit Lebey, I always cross-check with another guide to get another view. I generally consult Pudlo, which I find quite comprehensive and reliable, with useful up-to-date descriptions. I also use Pudlo for non-bistro restaurant selection. Here are some bistros that I've been to in the last 18 months or so that may be found in le Petit Lebey. Unless otherwise stated, all received a 3-cocotte rating. Time prohibits detailed descriptions, but the asterisks signify the ones I particularly liked. If you get to any of these, or discover other bistros that you really like, please post a comment or email me at bobbyjay@bobbyjayonfood.com. 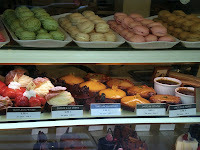 As promised, I tried a bunch of chaussons aux pommes during my trip to Paris. I started at the wonderful Dalloyau, 99-101, rue du Faubourg Saint-Honoré (8ème). I found the puff pastry to be excellent, but so high and flaky that it bore little relation to the apple filling. Next, I tried a chausson at Eric Kayser, 85, boulevard Malesherbes (8ème) as Molly Wizenburg had recommended. Better. Here the pastry was kept in check, and the apples kept a little texture, so each bite yielded a well-balanced mouthful of apple, butter, sugar and flour tastes. 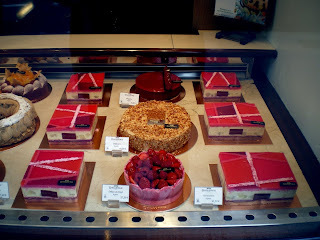 Third was Monoprix, which generally has decent, if not excellent, pastries. Bad: cardboard plus apple sauce. Fourth was Gérard Mulot, 76, rue de Seine (6ème), a great pâtisserie and home of the stupendous individual orange tart that is almost a crème brulée. Another disappointment: the pastry and the apple filling had nothing to do with each other. Finally, I tried Julien, 73, avenue Franklin D. Roosevelt (8ème), as recommended by Mimi. Second place: a relatively compact chausson with nice apple taste, and a bargain at 1.40 euros. The bottom line for me, though, after all this sampling, is that I prefer my hand-held puff pastry plain (croissant) or stuffed with chocolate (pain au chocolat). And I prefer my apples atop a classic tarte. But millions of French people can't be wrong (at least not about a pastry), and there are as many versions as there are pâtisseries, so please try them for yourselves and let me know what you discover. 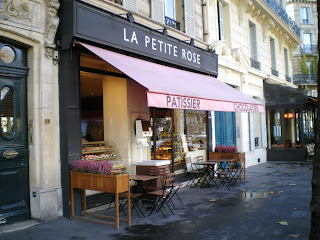 A little known, but really excellent, patissier in Paris is La Petite Rose, located at 11, boulevard de Courcelles. It is run by a Japanese woman and all the people who work there are Japanese women who are perfectly bilingual (I don't know about English). The tarts are fantastic, particularly the individual lemon tart (pictured at left), which is the best I have ever tasted (and I have tasted them at the best-known patisseries in Paris). 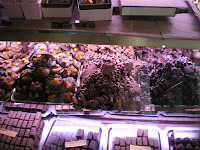 The home-made chocolates are also superb, especially the mendiant noir (pictured at right, second from left in top row). Since La Petite Rose is not so well-known and not located in a very fashionable neigborhood, their prices are about 30% lower than at the most famous patisseries: a screaming bargain. Paris -- Oyster Lovers' "Club"
Last night, my first back in Paris in four months, I went to the little oyster bar at Garnier, near the Gare Saint-Lazare. I don’t love Garnier, but there is this intimate room just past the oyster shuckers outside, before you actually enter the restaurant, that is a jewel. 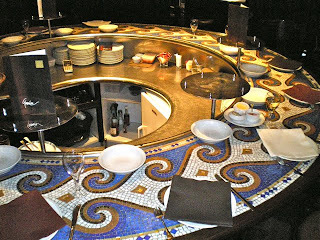 There are 12 seats arrayed in circular fashion (about 300 degrees of the circle) around the barman, who takes your order out to the oyster shuckers and makes up plates of fairly undistinguished brown bread with two kinds of butter: ordinary and with algae (the latter having a wonderful redolence of the sea). Upon entering, every customer nods at the ones already there, thus forming an ad hoc club of oyster devotees. Last night I encountered a late-middle-aged French couple, a young man with two older women, one of whom was probably his aunt (really! ), a young couple with a woman who certainly was the mother of one of them, a heavy-set Italian tourist with an enormous appetite. As usual, I order the plateau ostréicole (mixed oyster plate), which consists of two oysters of each of six kinds, and crevettes roses, served with simple mayonnaise. My favorite oysters were the Utah Beach (from Normandy, obviously) and the perles blanches but all were delicious – fresh and briny. What could be a more simple, or more delicious, meal? There is a charming article (including a recipe) in November's Bon Appetit about chaussons aux pommes by Molly Wizenburg. I have eaten them over the years and, frankly, never considered them to be in a league with croissants or pains au chocolat. However, I am on my way to Paris tonight and hope to try a chausson at one or more of the patisseries that she recommends; perhaps, like Molly, I will become a convert. A wonderful selection of artisanal American cheeses may be found at Saxelby's, in New York's Essex Market. Go to Links, at right, to link to Saxelby's. I like to chop things, using and improving on my knife skills (see my earlier post "Knife Skills"). But not nuts or chocolate, which fly all over the kitchen where our dog can get them (and chocolate, of course, is dangerous for dogs). So I was intrigued to see Michael Chiarello use this chopping device on Easy Entertaining for a variety of things: nuts, garlic, parsley, mint. After all, if a real chef can use it, why can't I? 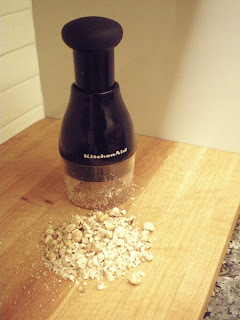 Well, I bought one for only $14.95, and can report that it is great for nuts (see toasted hazelnuts pictured above), very good for garlic, and okay for parsley, mint and scallions. Cleaning is not difficult but there are a lot of parts, so I wouldn't use it for less than four cloves of garlic or 1/4 cup of greens. I haven't used it for chocolate yet: I try to buy it in chips so I don't have to chop it. The bottom line: a useful gadget that is cheap and doesn't take up much room. There are a number of brands, and some may be even better than the KitchenAid, but I can only vouch for this one. Bobbyjayonfood.com, as its name indicates, is devoted exclusively to food and food-related topics. But the election of Barack Obama as President of the United States is such an extraordinary event that I feel compelled to make an exception and to take note of it. In electing Obama, Americans have chosen hope over fear, idealism over cynicism and internationalism over unilateralism. In electing Obama, we have realized the promise of the civil rights movement and sent an important message to the world: The American Dream is still alive. Since just after 9/11, I have lived in France for about two months a year, and I have been struck by how much the French and others around the world care about the United States and look to us for moral leadership. They have been deeply disappointed in us as our administration has pursued policies that have consciously undermined the world order. Although the American people did not really elect George Bush in 2000 – it took the Supreme Court to accomplish that – we actually did reelect him in 2004, after we knew what he and his administration had done to destabilize the Middle East and to rob Americans of the precious liberties guaranteed by our Constitution and Bill of Rights. I cannot fathom this myself and accordingly have been unable to explain it to my French friends and acquaintances. I have supported Obama since reading his moving book, Dreams from My Father, in which he describes his multi-ethnic and -cultural background and his search for his identity. His story embodies all that has been best about America since its inception. Obama is a gifted leader who I think is uniquely suited to convince non-Americans that what they admire most about us – our freedom, our devotion to equality and justice and our ability to look to the future – remain fundamental characteristics of our nation, and that they are justified in looking to us for leadership and partnership in confronting an uncertain and ominous future. Our European friends are as thrilled with the election of Barack Obama as I am. I hope we can all help him to lead us to a better place. I have recently discovered Harold McGee's On Food and Cooking: The Science and Lore of the Kitchen. (Although, from the blurbs on the back cover, it appears that every major player in the food world had already discovered it.) This is an amazingly comprehensive treatise on the named subjects, and if you are interested in food, you need this book. For example, I was recently trying to find out the difference between blackstrap molasses and other kinds. McGee has an information-filled page, as opposed to a short (and not useful) paragraph in the Larousse Gastronomique, itself a worthy resource. Not only that, but I found myself in the middle of a fascinating section on the refining of sugar, with a lot of useful and interesting information on "factory" brown sugars like demerara, turbinado and muscovado and refinery brown sugars (all other kinds). Not the kind of book to read cover-to-cover, but a truly wonderful and essential resource.